Hi! Long time no see. I had grand intentions of posting after the holidays but I seem to have been in hibernation mode these first few weeks of January. However, it’s time to get back on track because the first early spring rollout is here at J.Crew! I also plan on getting back to monthly work wear outfit recaps. The first rollouts of the year are always kind of blah to me. I have a January birthday and when I would look at picking out clothes at different retailers, it was hard to think about buying light airy clothes while we’re still fighting freezing temperatures. Yet, if I wanted a coat or something, they were nowhere to be found. As usual, I digress. I stopped by my store earlier this week as they were putting out the new arrivals from the February style guide. I felt a bit guilty messing up all of the piles of neatly steamed clothing but as the store was empty and I had some time on my hands, I figured I should try some items to share. First up, the Striped Boatneck Tunic with Tie and the Maddie Pant in Bi-Stretch Cotton. These pants…these pants! The wool Maddies were not a good fit on me but I took a chance on the cotton and I can see why there are five star reviews. There’s room for my hips, they aren’t loose on the waist and they are a full length that looks good with heels or flats. Win! They’re a stretchy cotton blend so the real test would be how they wear over the course of the day of sitting at work. But, they’re wishlisted for warmer weather for sure. I’m wearing a size 12 and I still had a little room so I’d say they’re true to size to slightly generous. And belt loops – yes! As for the top – I liked this when I first saw it but I wasn’t completely sure of it in person. I am wearing a size 10 which is the smaller of my two top sizes and I was glad that it still fit over my hips. The tie is a bit fussy and I think it has to be tied exactly right. I liked this better looking at the photos in person than I did in the store. I think I want the neckline to be different but there are a lot of people who will look cute in this. It was a no go with a blazer over it. Next up, the Tippi Sweater in Ornate Floral which I’m wearing with the Martie Pant in Windowpane. This print isn’t really my style from a color stand point but I think a lot of people will be in to it. I’m wearing a medium in the sweater and a size 12 in the pants. The sweater was a good fit and the Marties are a smidge snug. The tall size would probably work a little better from a size and length perspective. I like the smaller windowpane print on these and I like the navy. I have the gingham Martie pants from last year so these aren’t a must have right now. Next up, the Ornate Floral Ruffle Trim Top in Silk. Again, this print isn’t for me, but I think a lot of people will like this. The colors are more muted. I’m wearing a size 12 and it still seems a little short to me. I can take or leave the ruffle detail at the sleeves and neck. I think it would look good with a navy or khaki suit and there are a lot of colored cardigan options to layer over it. Next up, the Tippi Tie-Neck Sweater in mint/navy color combination. Oh, you know me. I love stripes. The tie neck on this is where I’m not totally sold. I’d love the green on the collar and cuffs only with the rugby stripes. I’m wearing a medium and this feels like the slightly thinner merino wool that we’ve been seeing lately in the Tippi sweaters. There’s only one colorway online but I’m fairly certain my store had another color combination in this sweater but I can’t for the life of me remember what colors. Next up, the Chambray Regent Blazer with Ruffle Trim paired with the Michael De Feo for J.Crew Printed Daisy Vase T-Shirt. I was immediately drawn to this t-shirt. I’m honestly not familiar with the artist but I have a daisy graphic tee from several years ago that I can’t quite part with. I though this was fun on it’s own but really liked it with the blazer. I’m wearing a large and it was on the looser side but not sloppy and it wasn’t too sheer either. The blazer is just ok to me. I’m wearing a 10 in the blazer which is true to size for me. I do love the Regent blazer and it’s become my new go to blazer because I can wear it with my work wear or with more casual clothes. 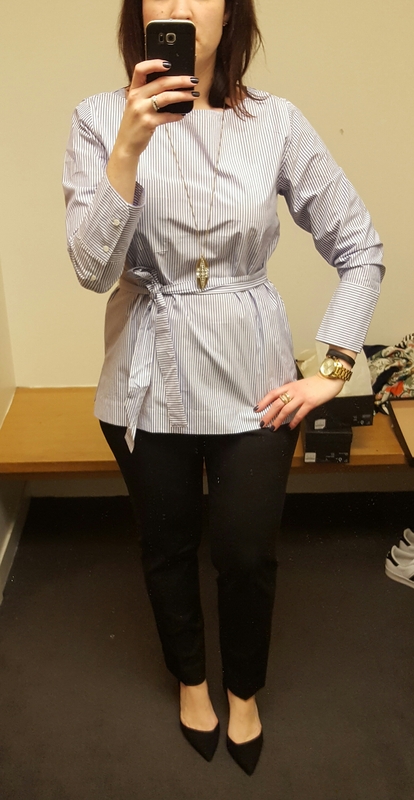 I have a chambray blazer already so this is probably a pass for me but I liked the tee under it and am now regretting leaving the store without the t-shirt. Next up, the Michael De Feo for J.Crew Striped T-Shirt with Painted Flowers and the Tailored Chino Pant. This t-shirt is a size medium and was still slouchy so it definitely runs big. I liked this shirt better from a distance but it missed the mark in person to me. The colors were more muted than I expected and the ivory stripes makes it all appear a bit muddy. And the chinos. The 90’s girl in me who lived in chinos screamed “try them on!” but my sensible side said “these are going to look horrible on you.” Well. They fit in the waist/hips better than I expected but they are a tad too wide for my liking. Had these been slightly slimmer I might have been on board. They are a slightly higher rise and you will definitely need heels/wedges with them. These are a size 12. And I’m 5’8″ and they were full length with heels. These do come in petite too. I think if I were a size or two smaller I might be all over these. Next up, the A-Line Dress in Vineyard Jacquard. I liked this print when I saw it online and wish that it came in a pencil skirt or even a shell. I had a feeling the dress would be too short and I was right. I’m wearing a 12 and while it was too short it’s also big in the waist / chest area. This does come in tall so if I were to try it in a tall size I’d probably attempt a 10 Tall. The pattern doesn’t line up at the seam which could be a deal breaker for a lot of people. Lastly, the Pencil Skirt in Ratti Striped Floral. This is a print people are going to love or hate. It’s personally not a love for me. There are several items in this pattern – a blouse, Tippi sweater and several bathing suit pieces. I’m wearing a size 12 which was a little snug but I think the print accentuates that as well. It’s not for me but that’s ok – not everything can be a hit. So how about you – any favorite items from this rollout? Would love to hear what you think and thanks for visiting! Thanks, Ann. I appreciate your detailed reviews! I didn’t look twice at the Tailored Chino Pants when I saw them online, but really like them on you. I was also debating between the Daisy and the Painted Floral tees. I was hoping the colors would be brighter, clearer in the Painted Floral, so It looks like the Daisy tee is the winner for me. I love the long cuffs on the striped tunic top. Very Thomas Mason. Thanks for the reviews. I just came back from the store today. I really like the Daisy Tee and the Tippi in Ornate Floral. The print is a bit dull but I like the sweater in this print the most. The skirt doesn’t feel like poly and actually feels like it would be good quality. I’m just not keen on the skirt with this print. Sometimes I feel guilty because they actually offer this skirt in tall sizes but I’m not interested. I’m always grateful for tall options but sometimes what I want to be offered in tall isn’t and the stuff I don’t care for is. I love the colors in Vineyard Jacquard Dress but worry that the tall will still be too short with a waist that’s too high. Anyway, thanks for your reviews. The print skirt has a pretty unfortunate design. The center of the flower hits a really dad place on a woman. Not your fault–the designer should have taken another look.